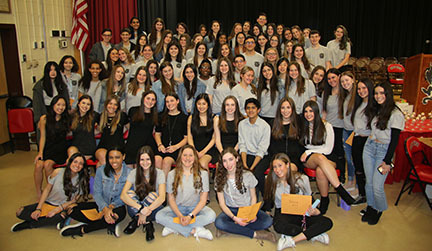 The newest members of the National Art Honor Society (NAHS) at High School East were inducted on Thursday, April 4th. 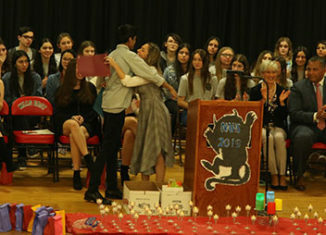 The ceremony was welcoming for the new inductees and was also a memorable event for everyone involved. Dr. Strong, Mrs. Uttendorfer, who is the advisor of NAHS, and the NAHS board all spoke about the importance of this honor society and why art is so influential and important in the lives of students. Each board member spoke about the accomplishments of NAHS throughout the year, including Safe Halloween, Students Rebuild, and the Senior Banquet. The new members were given recognition for their hard work and received certificates. Additionally, the new inductees all lit a candle while receiving their award. Six seniors, who are continuing to pursue art in college, received scholarships. Money was raised for the scholarships by selling unique pieces of wood with artwork on them created by NAHS members. The remaining seniors also received cords to wear at graduation. The students accepted their initiation into NAHS with a pledge at the conclusion of the ceremony. After the ceremony, students and families stayed to enjoy baked goods and to observe the impressive student art on display. The NAHS induction was an overall success for the art students and the entire community of High School East.